We wish you a merry Christmas. 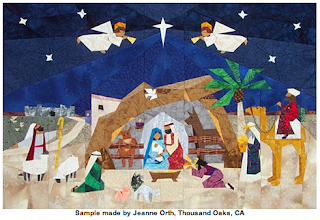 . .
Ok, now that I am all warmed up with the paper piecing - here is the July challenge. 10 of us girls have decided to all do Paper Panache's Nativity. So here we go. I've got my color sheet all ready, fabrics selected, separate sewing area and I am off. We will do one section each day for 25 days. Then sew them all together and QUILT them!! Yes, this puppy is gonna be done! Nothing like a little peer pressure to make sure things get done! Here fishy, fishy. . . Some of the ladies came over yesterday and we had a little stitch in. What a great treat to sit with friends and sew! Felt great!!! I brushed up on my paper piecing skills and made this little fishy. The best thing about him is he is done!!!!! He is an Eileen Sullivan (The Designer's Workshop) pattern and fabrics are from her kit. I just love her stuff!!! Joan gave her slide show and 'lecture' about her trip to the states to her Guild the other day. Of course, Paducah was the highlight! How could it have not been with glow in the dark vests??? Apparently, Waverly Patchworkers in Melbourne, Australia, will never be the same. Joan is available for the International Lecture Circut. Professional fees apply.